August 24, 1909: An honest slide by Ty Cobb — or malicious intent? If you can help us improve this game story, contact us. In baseball’s rough-and-tumble Deadball Era, no player was more vilified for spiking his opponents than Detroit’s Ty Cobb. 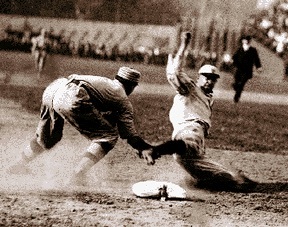 While there’s no doubt he spiked many players during his 24-year career, a large part of Cobb’s reputation as a vicious baserunner stems from an incident that occurred in the heat of the 1909 American League pennant race. The play in question not only endangered the Tigers’ chances of winning the league title, it also threatened to end Cobb’s blossoming Hall of Fame career. The Tigers and Philadelphia Athletics began a fierce rivalry in 1907 as Detroit rose from mediocrity and became a league force. The Tigers played some tense games with the Athletics that season, including a memorable 17-inning tie in late September during a tight pennant race. Detroit captured its first American League pennant by 1½ games over the Athletics. Cobb also emerged as the league’s biggest star, winning his first batting title and leading the junior circuit in hits, RBIs and stolen bases. The enmity between the teams extended into 1909. Detroit set out to capture its third straight pennant while Philadelphia kept pace in the standings. By late August, the Athletics had a one-game lead over the Tigers when they began a three-game set in Detroit. Sportswriters anticipated a tense series and felt its outcome would have a major impact on the pennant race. At that point in the season, Detroit had won just four of 15 games against Philadelphia. The Athletics arrived with a five-game winning streak and rookie third baseman Frank Baker. He had already earned a reputation as a powerful hitter by socking the first home run to clear the fence in Philadelphia’s Shibe Park. Sparks started flying in the first inning of the series’ first game, played on August 24 before a near-capacity crowd of 9,711 at Bennett Park. Philadelphia scored two runs off Tigers starter Ed Summers in the top of the first. Detroit tried to counter against Athletics left-hander Harry Krause in the bottom of the inning. With two outs, Cobb walked, stole second, then attempted to steal third as batter Sam Crawford took ball four. The Athletics added a run in the ninth and loaded the bases with one out. But Tigers right-hander Bill Donovan retired the final two batters to seal the 7-6 victory for Detroit. Fans rushed onto the field in joyous celebration after outfielder Crawford caught an easy fly for the final out. Controversy swirled for several days as the Tigers swept the Athletics to take a two-game lead in the standings. Would Johnson banish Cobb from baseball? Or was Cobb’s slide clean? Kuenzel’s photo is one of the most widely reproduced images from Cobb’s career, appearing in countless publications through the years. Cobb, Baker and Mack came to terms about the incident. But the play became a notorious part of the Cobb legend, seemingly gaining embellishments with each passing decade, much to his chagrin. Was Cobb completely innocent, or was Mack right in his assertions? Regardless of intent and photographic evidence, the Cobb-Baker incident remains one the most controversial and widely discussed plays of the Deadball Era. This article appeared in "Tigers By The Tale: Great Games at Michigan and Trumbull” (SABR, 2016), edited by Scott Ferkovich. To read more articles from this book, click here. Alexander, Charles C. Ty Cobb (New York: Oxford University Press, 1984). Cobb, Ty, ed. William R. Cobb. My Twenty Years in Baseball (Mineola, New York: Dover Publications, Inc., 2009). Jones, David, ed. Deadball Stars of the American League (Dulles, Virginia: Potomac Books, Inc., 2006), 546-550, 620-624. Lieb, Frederick G. The Detroit Tigers (New York: G.P. Putnam’s Sons, 1946). Macht, Norman L. Connie Mack and the Early Years of Baseball (Lincoln and London: University of Nebraska Press, 2007). Sparks, Barry. Frank “Home Run” Baker: Hall of Famer and World Series Hero (Jefferson, North Carolina: McFarland & Company, Inc., 2006), 28-33. 1 “Told about the Tigers,” Detroit Free Press, August 25, 1909. 2 “Fighting Spirit Is Again a Prominent Feature of Playing,” Detroit News, August 25, 1909. 3 “Told about the Tigers,” Detroit Free Press, August 25, 1909. 4 “One More Regrettable Athletic-Detroit Controversy,” Sporting Life, September 4, 1909. 6 “One Way to Beat the Tiges,” Detroit Free Press, August 27, 1909. 7 William W. Lutz. The News of Detroit: How a Newspaper and a City Grew Together (Boston: Little, Brown & Company, 1973), 159-160. 8 “The Disputed Play on Account of Which Philadelphia Now Wants Ban Johnson to Drive Ty Cobb From Organized Base Ball,” Detroit News, August 27, 1909. 9 “Told About the Tigers,” Detroit Free Press, August 28, 1909. 10 Al Schacht, “Mr. Mantle and Mr. Moore,” Rome (Georgia) News-Tribune, September 13, 1953. 11 Tommy Holmes, “Cooperstown Ceremony Recalls Old Stories of Baseball Greats,” St. Petersburg Times, August 2, 1955. 12 Ty Cobb with Al Stump, My Life in Baseball: The True Record (Garden City, New York: Doubleday & Company, 1961), 114-115.